Blah - So this is my first level for Unreal Tournament. Many years with Build was enough. So I needed something new. This is also probably my last level for UT because I'll move to Unreal Tournament 2003 next (probably). 'DM-MSut1' is a medium size medieval theme level. There are some nice locations & details but it's not filled with them. There are small & large areas, outdoor & indoor areas, sniping spot etc. 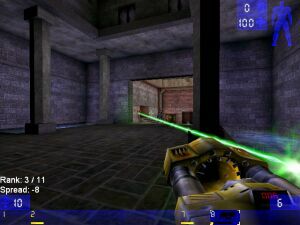 MSut1 is a deathmatch level which is recommended to play with 8-12 players (bots).